Now available across Canada and USA online by Skype! BOOK A FREE CONSULTATION CLICK HERE NOW! Panic Attacks: Sudden episodes of intense fear that manifest without apparent reason and trigger intense physical reactions. Panic Attacks are one of the most frightening, but thankfully non-physically harmful anxiety episodes there is. Their physical description is likened to a heart attack and their psychological affects are extremely frightening. The symptoms of a panic attack include dizziness, increased heart rate, nausea and shortness of breath. Because the symptoms are so closely related to that of an actual heart attack and other life threatening conditions, it is very important to get an accurate medical diagnosis. Where do Panic Attacks come from? Panic Attacks are caused by a variety of psychological mechanisms that include your beliefs, your thinking styles, self-esteem and personality. Anxiety is a a relatively permanent state of worry and nervousness that can manifest itself in many ways such as panic attacks, fears, phobias, and many other symptoms. Unlike worry which is an appropriate response to life’s circumstances, such as losing a job, anxiety lingers and lasts beyond theses circumstances. To resolve your Panic Attacks you first need to understand how they were created in the first place. THRIVE gives you the insights and resources to understand the mechanisms that must be in place to create these states so that you can permanently change them. Thrive is one of the best training programmes in the world to give you the resources and insights needed to make permanent changes in your life. THRIVE is a SIX week, Seven session programme. View progamme layout here. Why is it vital to understand how my Panic Attacks were created? Now let’s say I just rescued you by helicopter and plopped you back in familiar territory but gave you no map and no resources to not make the same mistake again. You are likely to get lost again! THRIVE gives you the map and the resources to get out and to never again fall into the mental traps that created your panic attacks in the first place. The majority of my clients have already been through months, even years of “therapy” and yet their problem persists. The reason for this is all in approach. Most therapies focus on the symptom by rehashing similar patterns in the clients life experience giving them plenty of insight on how they got their symptom but very little insight into the factors that underlie them. Because the underlying elements haven’t changed the symptom is likely to return. With some personality types this only helps to reinforce their feelings of powerlessness over their situation. The difference with THRIVE is that it sees the symptom as something as completely separate from the cause. Once you are given the insights on the factors that created your Panic Attacks and focus on changing them the problem ceases to exist. THRIVE is about giving you back control once and for all. Traditional hypnotherapy (also known as Suggestion Therapy) falls short because it deals only with the symptom and not the cause. In traditional hypnotherapy your Panic Attacks would be suggested away under hypnosis with suggestions like ‘you feel calm and at ease in situations that had previously upset you’. While you will probably leave the hypnotherapist experiencing less attacks, the originating cause of that symptom, the psychological traps have not been addressed. Because these traps are still there, they will find an ‘outlet’. So you may not experience your Panic Attacs as often, but now you fear social situations or you are more anxious in general. This is known as symptom substitution and is a very real phenomenon. Worse yet, suggestions from a hypnotherapist don’t always last forever, so in a few months time, your Panic Attacks may well return. For these reasons, traditional hypnotherapy (suggestion therapy) is not recommended for Panic Attacks. Panic Attacks are the result of a variety of different psychological factors, TRHIVE is the very best training programme available to permanently resolve these attacks and the anxiety that creates them. In a relatively short period (7 weekly sessions) you will gain the insights and resources necessary to make permanent changes to your life and your Panic Attacks for good. Not only will you symptoms disappear, but you will feel calmer and more in control of your life in general. Other therapies including CBT, psychotherapy, Hypnotherapy, EFT, NLP only ever deal with the symptoms of your anxiety, leaving the root to manifest elsewhere. Why control your problem when you can rid yourself of it once and for all. I have had problems with panic and anxiety for almost 7 years. I started seeing Daniel when my attacks started to happen more frequently. Daniel is a very passionate, understanding, and caring (please insert therapist, analyst, whichever suits here best) He introduced me to Rob Kelly’s Thrive Program, and told me it would change my way of thinking. Being in traditional therapy before made me wonder how good this was going to be. I was amazed at how easy it was with Daniel’s guidance, and calm demeanour, that I was able to change my way of thinking, and actually Thrive and gain control of my life. I have been without a panic attack for almost 2 months, and continue to reinforce and use the techniques introduced to me by Daniel and the Thrive program. 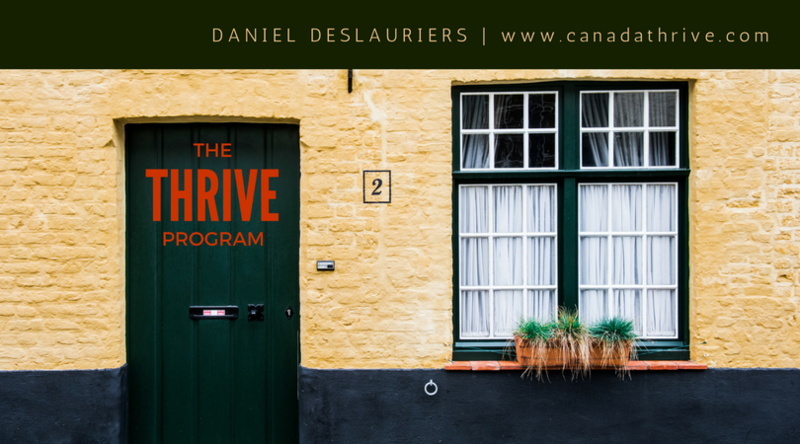 If you suffer from panic, anxiety, depression, or just want to gain control of your life, you owe it to yourself to speak with Daniel, and learn about the Thrive Program. Time for Change – Fantastic book! After suffering a bad sickness I was constantly worried about my health and becoming ill, I shut myself away and created a lot of anxiety about leaving the house which caused panic attacks. For 3 years I followed the same routine, I visited several doctors about different symptoms & worries, each time it was the same diagnosis, ‘anxiety’. They never told me what I could do to help it though, this made me feel it was just something I was going to have to deal with and there was no ‘cure’ for it, I felt out of control & powerless. That’s when my friend recommended I read this book, for a couple of weeks I was apprehensive, I never thought it was going to work, I had given up hope, in the end I decided to give it a go. I began going through the book with a Thrive Consultant in Ipswich called Noel Wilson, each week we would discuss the chapters I had read. It was unbelievable what I was learning, I would constantly find myself nodding along to the book, it was as though It was a book written about me! Everything I read related to exactly how I felt, It not only described how I felt it told me why I was feeling that way and how I could change it! It was fantastic, in just 6 weeks my life completely changed, and not because I was taking medication prescribed by a doctor or because I waited around hoping one day something would change but because I CHOSE to make my life change! I am no longer worried about leaving the house, in fact I now enjoy travelling. Once you understand it’s your thoughts (the little voice saying ‘what if’) and beliefs which hold you back and YOU control them it’s easy to change them and instead make you “Thrive”! I highly recommend this book, it was written excellently in such a way that everyone can benefit! It is a fantastic life changing experience and my thanks go to the author and my hypnotherapist for teaching me how to Thrive! For the past 30 years of my life, I have had a debilitating fear of vomiting in public. Before I had to leave my house I would suffer from panic attacks and would vomit as a result of my phobia. I would starve myself of food all day or make myself vomit, just in case I had to leave my home…I might vomit in public. Over the past 12 years I have spent thousands of dollars on “treatment” for my Social Phobia, Agoraphobia, Panic Disorder, Depression and Emetophobia nothing I tried worked. My life was an absolute mess! My fears were affecting my marriage, my children and my health. I was at breaking point. In July 2013, I discovered Rob Kelly’s book ‘Cure Your Emetophobia & Thrive’. So I made an appointment to meet with Liz Hogon a Thrive Consultant, to try yet another treatment option. I went into this latest venture guarded and sceptical. Within 6 short weeks of meeting Liz and beginning the ‘Cure Your Emetophobia & Thrive’ program, my life changed dramatically. I used to suffer numerous panic attacks everyday and vomit sometimes as much as 5 times a day. Since completing this program, I haven’t vomited in 4 weeks! Only a short time ago I was terrified of leaving my house and of eating, I now put my two young children in the car and drive to places we have never been and have lunch in public places and I am finally loving my life. Before discovering Rob Kelly’s program and working with my supportive consultant Liz, doing these things were unimaginable to me. I was a prisoner trapped by my own negative and obsessive thinking. This program is not a magic cure you have to do the work. But if you want to gain control of your life and not just live, but THRIVE then this is the program to choose. Rob Kelly’s book taught me how to live without fear of my own thinking and I am forever grateful as is my family. Before going to see Alison, I was suffering from social anxiety and panic attacks. It got to the point in which, I rarely left the house and wouldn’t go into social situations. Missing out on all the things teenagers would do was hard; as well as missing tonnes of college. From the very first session with Alison, things started to get better and progress was made. Alison is a warm, friendly individual who is very easy to talk too. things have come out of it. At first, I didn’t think it’d benefit BUT when using the methods, things became a lot easier to deal with and now my perspective of situations has changed. doing what I’m doing now. Thank you! Recently I had had a very stressfull time at work and had a panic attack during a meeting (how embarrasing) I was mortified and felt my career was in danger if I could not get myself under control. I also started having very very black days of depression. At this point I decided to seek help and managed to find Sarahs link on a website. I have to say I chose her because she had a very pretty faceand looked friendly. I met Sarah and started on the thrive program. To be honest I have not looked back. It has been very hard for me as I have had over 20 years of habit forming and believing I am not in control and that has taken some time to shift but I feel SO much better during my day now. My depression has ended and so have my panic attacks. i still get a bit nervous soemtimes during a meeting but even this is getting much better. This is all down to Sarah and the Thrive program and i can’t thank her and Rob enough really. This is my little mantra. “Everyday in every way I make myself better and better” It works. Give it a go you wont regret it. “I went to see Pat in January 2013. For my whole life, or certainly as long as I can remember I have had an intense fear of blood tests, injections and anything remotely related. I would work myself up into such a panic that I would actually faint during the procedure. This would cause me the utmost embarrassment and I would do whatever I could to avoid having any injections, even to my own detriment. I then found out that I was pregnant and realised that something had to change. I could no longer avoid these things and realised I would have to face them head on. I found Pat’s details on a website and thought I would give it a go. I remember my first appointment, and I must admit I was sceptical as to how this thing that had encompassed my whole life could be solved so easily and by ME! I then started the THRIVE programme and with Pat’s support and encouragement within a few weeks I began to feel like a different person. This may sound like a Cliche but believe me its true. This programme has helped me with so many areas in my life, even things that I didn’t realise were causing me issue. My self-esteem and general well being is now so much higher than it was and I feel able to cope with any challenge set me in a positive way. I have now had 2 blood tests and an injection since I finished THRIVE – The proof was in the pudding – I didn’t faint, in fact I don’t even use that word anymore! Today, when the nurse had finished I actually remarked “IS THAT IT.” 3 months ago it would have been a very different story. I had suffered with Anxiety / Panic attacks/ Social situations for a very long time, as such IT was starting to control my life in a bad way…. I was introduced to one of Rob Kelly’s therapists (Richard Brent), who gave me this book to read and work through it with him, and in 5-6 sessions I was fixed!!! I really enjoyed my sessions, I used to come out of there, the HAPPIEST I have ever been, so much so that my partner said I am now a completely different person. I think this book just really shows, that if you want to change anything in your life, the the ONLY person to do it, is YOU. Such an EASY concept but until you really grasp that concept, you will never understand that you don’t need any external sources anymore, and the only person you need rely on to fix You, is YOU! Such an amazing book, I just wish i’d read it sooner! I am now buying my first official copy for a family member! Thanks Richard!! The thrive programme has helped me so much throughout these last few months since finishing the sessions. Whenever i feel anxious or worried i will use the techniques you have given me. I have been in a few situations but i didn’t panic, I carried on with whatever i was doing and soon forgot about it. Also last year i felt anxious about being in an exam, if i was sick whilst doing the exam i couldn’t sleep or eat much. But this year, i felt absolutely fine doing my exams. I completely forgot about it! For once in my life i feel free. I can do whatever i want to do. I can eat anything without hesitating. For 5 years i had been living with emetophobia. Now after doing the thrive programme i no longer have this phobia. Thank you so much Cara! I had suffered from anxiety for all my life. I didn’t understand why, but I always got nervous ever since I was a child. The nerves would make me sick, have a bad stomache, have headaches and muscle aches, have terrifying panic attacks and suffer with sleeping. I associated my anxiety to food and didn’t eat any sugar or dairy products for over a decade. I had absolutely no self confidence, and didn’t believe that I deserve the things that other people have. As you can imagine, my life had become very bleak and I day to day life was an impossible struggle. I was ready to give up as it was all to much hard work and I couldn’t live like this any more. I have tried many interventions to ease the anxiety, but nothing helped. I had a long course of CBT which had no effect, have been on anti-depressants twice but this did not help control the nerves. I have bought many self-help books and self-hypnosis CD’s, which I have dilligently worked through but these also have not helped. At the end of my tether, I summond up the courage and called Rich hoping he could wave a magic wand and take it all away. Though I really didn’t believe anything could ever change. Amazingly, after six sessions with Rich, working through the ’Changing Limiting Beliefs’ workbook, I am CURED! Or should I say, I have cured myself!!! Rich taught me how to control my thinking, how to appreciate and acknowledge my achievements. I now know I can do anything that I want to do AND ENJOY IT. This has been put to the test over and over, and I have put myself in situations that I didn’t think I was able to cope with before. At first it took focussed hard work to change my thinking, but I controlled each situation with less and less effort. A week after I finished the course I was halfway through a social situation and I realised I had forgotten to panic! I now know and enjoy my personality type. Every day, I am feeding my confidence and I know I have never felt happier. I really did not think this was ever possible, and I have done it in 6 sessions. Thanks Rich for showing me how! If you can identify with anything I have experienced, the best thing you can do to change your life is to give Rich a call. You can do it too! As a teenager studying her a-levels, accused of being depressed, suffering from anxiety; a panic disorder and IBS, I was hugely sceptical when a close friend suggested reading Rob’s book. After spending countless hours in CBT, with doctors and discussing medication, non of which had worked for me, I was at the end of my tether. Yet I still couldn’t believe that this book i’d heard so SO much about could ACTUALLY help me. In fact, at the beginning, as Rob suggests, I didn’t believe it could. I didn’t want to believe it, I couldn’t believe it, and in fact, I’d kind of made up my mind, that on principle, I wouldn’t believe it. It was only after my doctor tried to put me on Prozac (I’m seventeen, and I don’t suffer from depression). That I seriously had to take matters into my own hands, to make myself better. Upon reading the first chapter, I realised, the book had been written for me. Upon completing the first three or so chapters, I realised the book had been written for everyone. Everyone in the world can benefit from it. Everyone in the world SHOULD benefit from it. This book made me realise that the only thing standing between me and everything I could want out of life, are some silly little ideas I had about how I cope. I refuse to let any dodgy thinking patterns prevent me from living my life to the full and ‘Thriving’ (Nice name by the way). My new approach to life? ‘Bring it.’ Everything has improved – scratch that, I have improved everything in my life, Even my SKIING. Being ‘ill’ isn’t an excuse any more. Times have changed for ‘disorders’. I honestly can’t thank the authors enough for providing me with a chance to live my life so freely. I met rob kelly a few years ago.. & i was a mess and i mean a BIG MESS!! I suffered severe emetophobia & panic attacks which crippled my life for YEARS..i thought i would always be like this.. I was given this book and it is so inspiring and motivational.. it literally Changed my Life!! If you want to make a difference and change your bad thinking habits &give yourself a new lease of life ..then It is a MUST READ!!!! Thank you rob!!!! I’ve ‘suffered’ with claustrophobia for as long as I can remember. I would always try to avoid situations that brought on the symptoms. It started off with small gestures, such as getting out of the queue for a roller-coaster (because I hated being clamped down by the safety bar) and eventually progressed to avoiding any situation that was even remotely enclosed. I would always have to sit in the front seat of a car, stand at the back of the crowd at gigs and get out of elevators if there was anyone other than myself in them. I’ve walked up hundreds of flights of stairs while my wife and friends have been waiting for me at the top having taken the lift. My symptoms progressed further and further until I realised that something had to be done. I visited three separate doctors and explained that I’d been having panic attacks and that I needed some help. Needless to say, none of them were much help (in fact one actually laughed and told me that I needed to ‘toughen up’). I began to get used to the idea that I would never be able to rid myself of this burden, until one day at work somebody mentioned that they had undergone hypnotherapy to deal with their vertigo. I eventually stumbled across Pinner Hypnotherapy and booked a consultation. As soon as I met Anne I realised that there was nothing to be nervous about, and more importantly, that she knew exactly what she was talking about. We decided on the best course of action and booked 4 sessions in advance. At first I was a little apprehensive, but before long it became second nature and I would actually look forward to our weekly sessions. I was given work/exercises to do throughout the week, each one more eye opening and life changing than the last. All in all, I think that going through the Thrive programme with Anne is one of the most important things I’ve done. It’s changed my life and given me the tools to deal with my claustrophobia….and life! I now get into lifts without hesitation and don’t even think about standing in crowds. I’ve also got a better understanding of how my head works. Since my sessions have finished, I’ve been trying to convince everyone that I know and love to work through the Thrive programme. Anne is a lovely lady. She is very friendly and intelligent and made me feel comfortable during our sessions. She made all my options very clear and helped me all the way through. I’ll never regret going to Pinner Hypnotherapy and I’d urge anyone with a problem (no matter how big or small) to go and see Anne…she’ll sort you out! This book has made a real difference to my life! Parts of me that I always thought I was going to have to deal with, like excessive worrying, panic attacks, I have been able to control through working through this book. I know now in the future if I have to deal with any serious set backs or sad times that I have the skills to do so and confidence in myself to achieve! There is nothing to be sceptical of in this book. Its not scientific, pscyhological mumbo jumbo, nor is it a superficial self help book. Instead it is something that everyone can relate to regardless of whether you think there is something specific you need help to change in your life. You won’t regret it. Hypnotherapy, Pure Hypnoanalysis and Hypnosis in GTA, Toronto, Sudbury, North Bay, Manitoulin Island, Thunder Bay, Espanola Mississauga, Hamilton, Barrie, Kitchener, Waterloo, Pickering, Brampton, Markham, Newmarket, Oakville.